Just dropping in to say Hi, and to tell you about a recipe I tried this evening, FINALLY. The weather here is warm, but will chill down later in the week. The AC is still on, but because it cools off a bit at night, I have to keep turning it UP. Oh, well. I spent ALL of today taking online technical exams for two upcoming job interviews. Long and tedious, but that’s OK, I had a couple of other things going on at the same time. The first was OK, but the second involved proofreading. Now for a writer, this is usually no big deal. But the whole proofreading section was foodie based: restaurant menus and tabs, vegetable purchase receipts, that sort of thing. The worst part was reading and proofing the various descriptions of a fictitious vegetarian restaurant called “Garden Greens.” It read like a badly written romance novel–irritating to read, and then I had to proofread and find the errors. You talk about a headache; no wonder I’m so tired! Tomorrow I head downtown for an interview for this company, and then I head to the Galleria area on Thursday to meet with one of so many job shops I hear from. They’re also known as temp agencies and headhunters. Mostly they just waste my time, but one of the jobs they have is for a copywriter, for which I am quite qualified. So, we’ll see, and maybe a stop for a coffee at Central Market on the way home. One in a million is what sent me to my last job, and to the job at Boeing where I hung out with the finest IT people in the world for 8 years. Oh, well. . . . I have a habit of printing off recipes and getting around to trying them “one day.” Of particular interest are healthier versions of popular things, and chocolate, as you might imagine, is tops. One of the most popular recipes floating around online is the infamous “microwave cake in a cup.” There are many variations, and for us gluten-free/yeast-free folk, this is a bonus opportunity. Dr. Steven Hotze, who I frequently refer to as “The God of the Hormones,” is big on healthy and yeast free eating, for obvious reasons. Physician’s Preference, his on-site vitamin store, publishes recipes on their blog all the time. This one, being chocolate, I printed and have moved around for over a year. 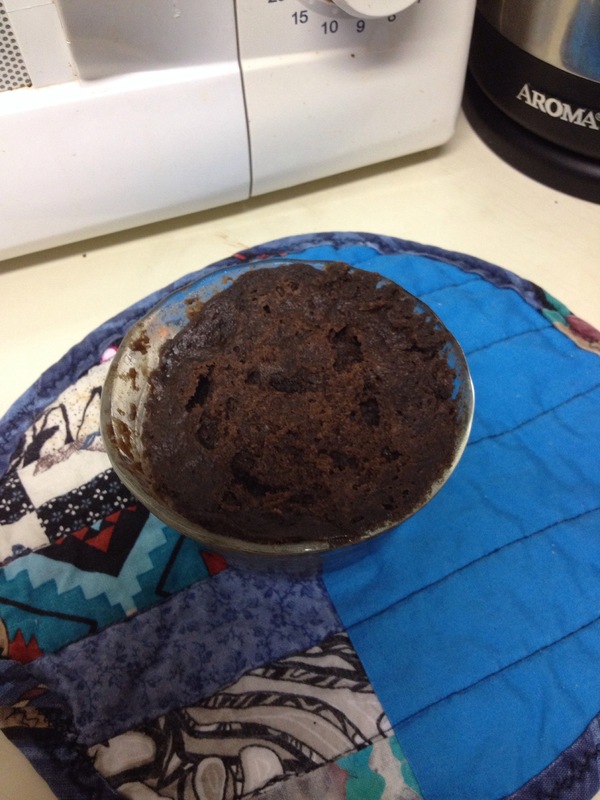 Tonight, I finally made this Microwaveable Chocolate Cake, and I have to say I am quite impressed. It worked!! Makes two, and I did, but only ate one. Honest! Gluten free chocolate cake in a cup. Go for it! Instead of Sweet N’ Natural, I did use SomerSweet, my favorite natural sweetener. Glad I bought a case a few months ago. Wish I’d bought more, but I only have so much room in the pantry. I wrapped the first one in the wax paper, and I should not have done that. But that’s OK, it came out just fine, even if it doesn’t look like the one on P/P’s website. The second one just had wax paper on top. YUM. I don’t know how big those ramekins are, but that’s OK. Use what you have, right? Mind you, it would have been perfect for Valentine’s Day, too. DUH. Oh, and that potholder I made from a book called Pretty Little Potholders. Made two of them. Used up some fabric scraps, that’s for sure. Haven’t made any more; they don’t really insulate your hands that well, so I’ll figure out another method for the next batch I make that actually keep your hands from burning, probably doubling the batting recommended.